This is a new part of this addictive puzzle game. It will bring you back to the funny Monsterland. You task is the same. You have to help two baby monsters to reach their mother. To do it, you will have to resolve puzzles and cut blocks. Do everything you can to help them! Everyone think that all the monsters are angry, bloodthirsty and dangeroues. But it is not completely true. 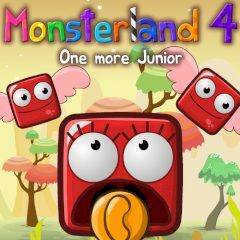 These little cute monsters are living peacefully in their Monsterland, enjoying the sunny days and having fun. But there are a lot of different monsters in this country, that's why this absent-minded mother often loses her children. And she lost them again today. And in this puzzle game, developed by Box 10 you mission is to help her. You will have to resolve a lot of difficult puzzles to do it. Cut blocs, push the buttons and switches to reach success. Every level will be more difficult with more challenging puzzles. So you will have to show all your logical thinking to win. If you don't know how to pass a level, you can replay it and try to pass again. Good luck!